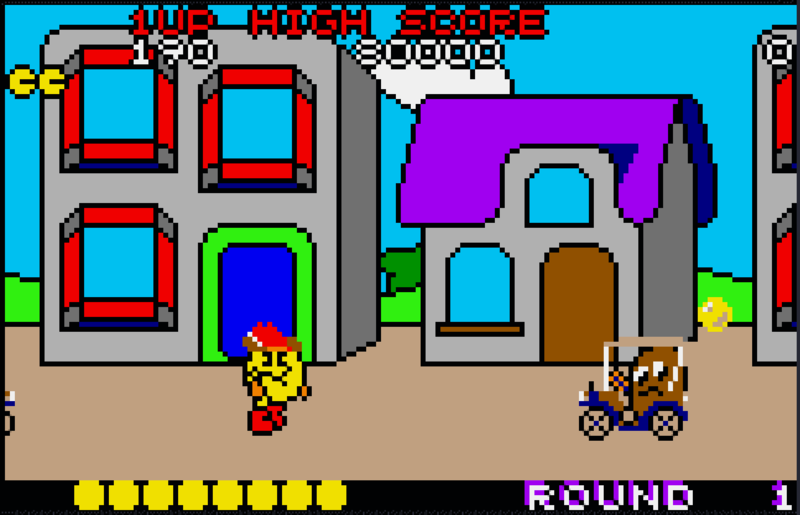 The Arcade Version's title screen. Thrilling! Once upon a time a range of computers and consoles happily co-existed. They were all completely different to each other, each with their unique strengths and weaknesses and numerous quirks. Developers had to write code specific to each system, to enable their programs to take advantage of the respective platform's features and capabilities. This meant that one game could look and play completely differently on one machine to the next. The differences could be slight, or they could be massive. This situation gave fuel to the playground arguments about which system was best. And, er, I'm boring myself now. Basically, this section, named "Conversion Comparisons" will pick a game and look at how it fared when converted from its original platform. 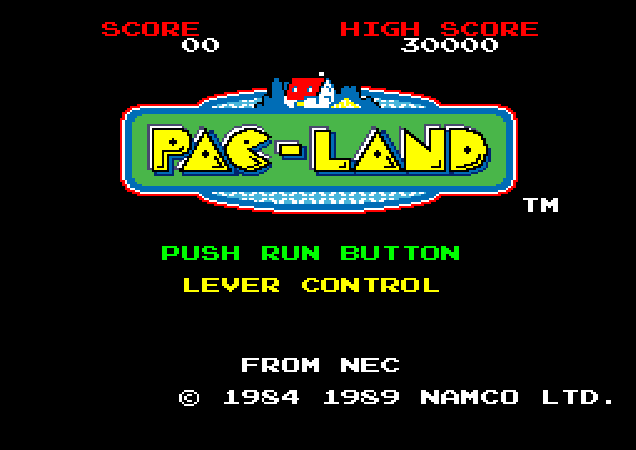 We start with Pac-Land. Pac-Man jumps over a car driven by a pink ghost. As you do. 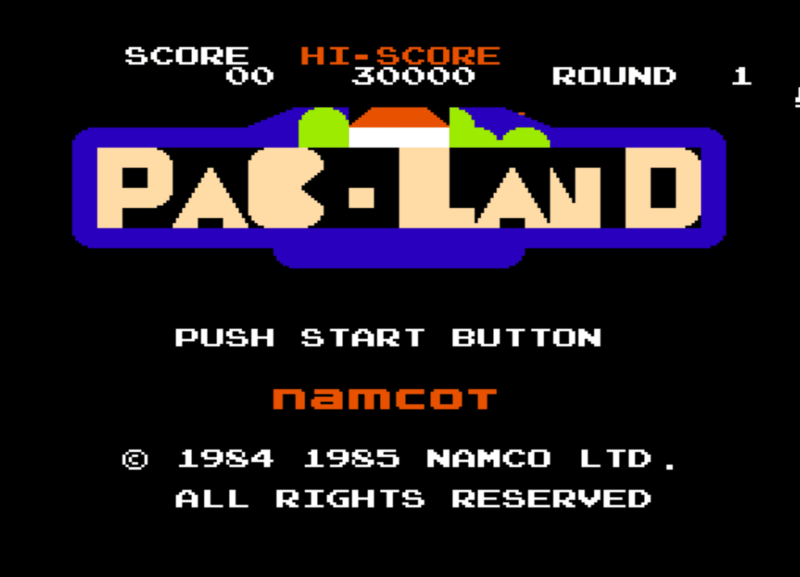 Pac-Land was one of the first true side-scrolling platform games, and was released in 1984 by Namco. 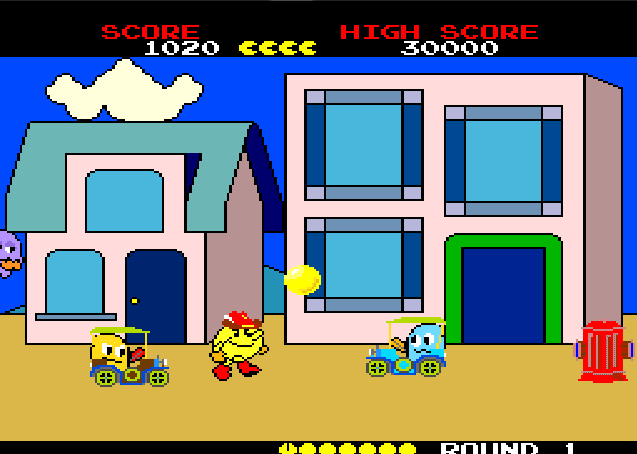 It was a sequel to Pac-Man and took much of its inspiration from the Pac-Man cartoon. 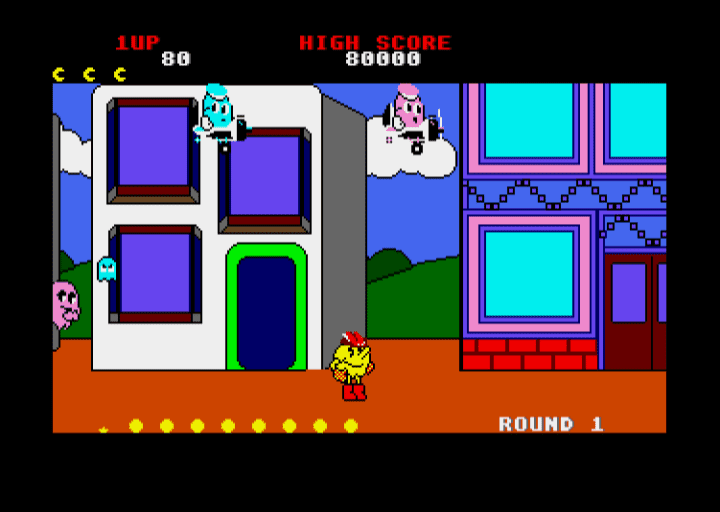 The general idea was to get Pac-Man from one end of the Pac-Land to another, collect a pair of magic boots from a fairy, and then go back home. And then, a little later in the day, do the same thing again. I'm not sure if the objective was for Pac-Man to obtain as many magic boots as possible for the Pac Family to hoard, but it seems plausible enough. 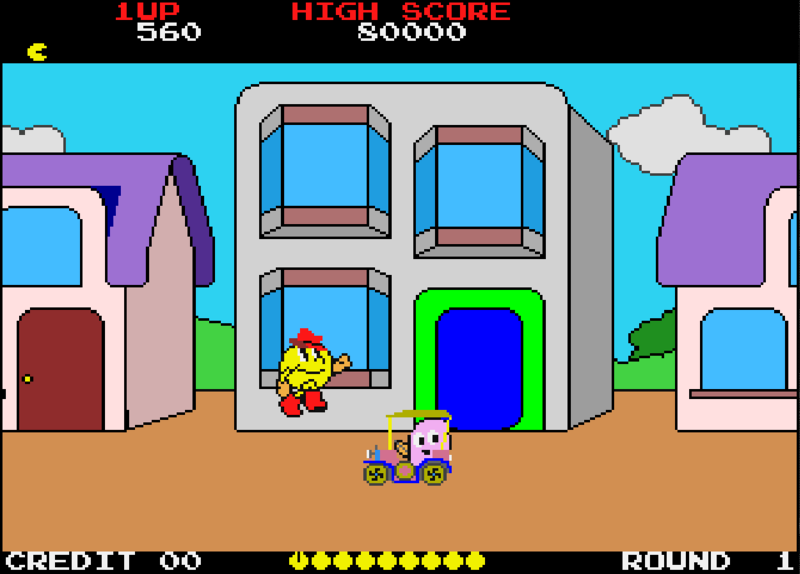 Making Pac-Man's journey slightly more difficult were the ghosts, intent on attacking him from all angles and in all kinds of vehicles and disguises. Pac-Man can only attack them after popping a power pill - otherwise he can only avoid them. Other hazards include seemingly endless bodies of water, collapsing bridges and bottomless pits. 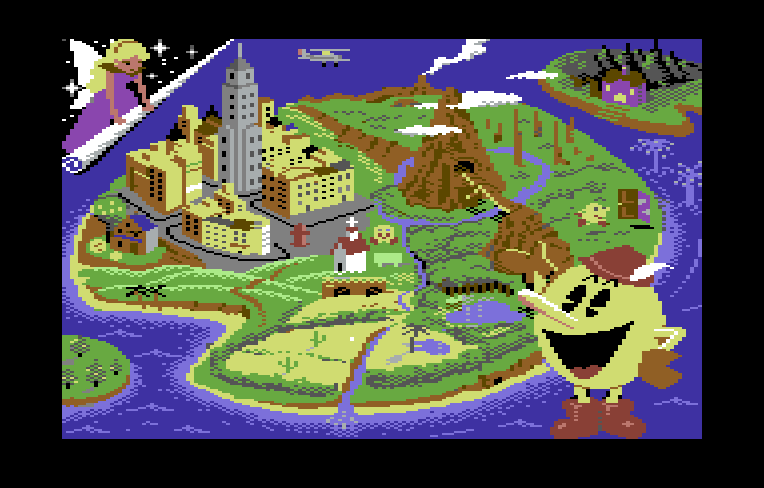 The return journey was easier than the outward journey as the magic boots gave Pac-Man the ability to float. Kind of. 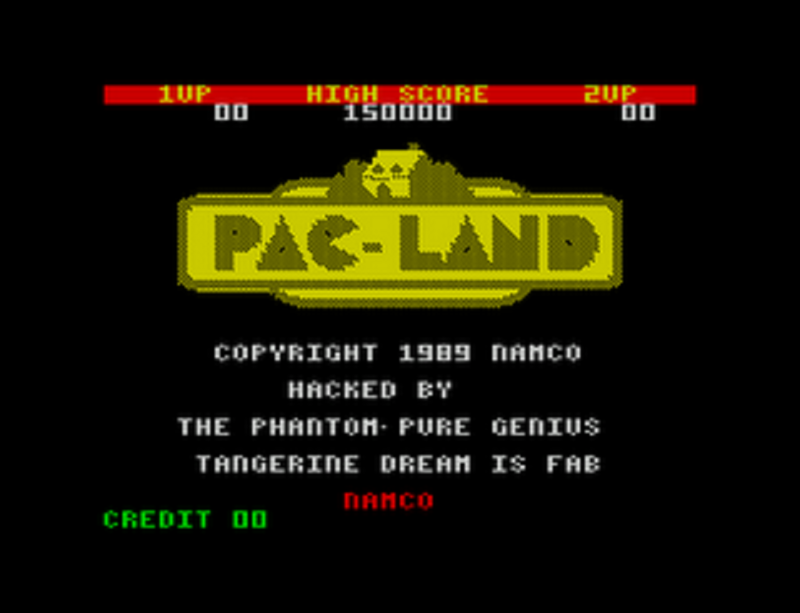 Pac-Land featured colourful levels, cartoony visuals (impressive for the time) and the theme tune playing constantly with accompanying sound effects. They all complimented each other perfectly, and the game, although simple, was fun and addictive and rewarded skilful playing. 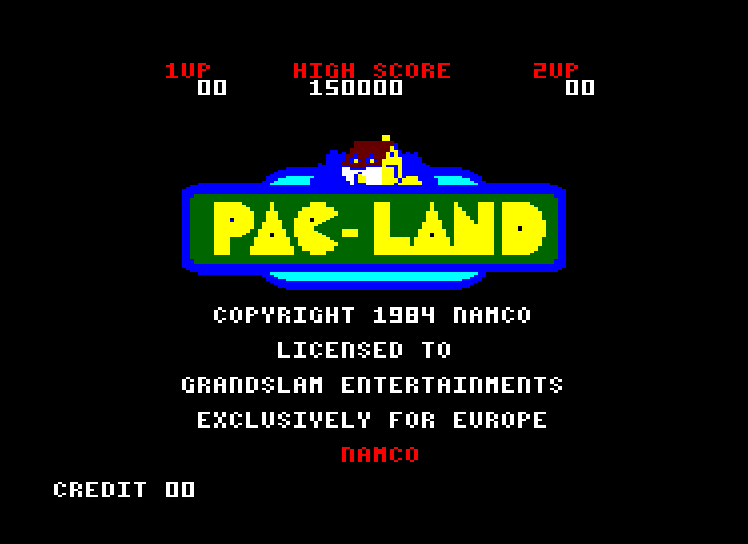 Pac-Land was converted to many of the major platforms during the late 1980s and early 1990s. Here is a summary of some of the conversions from worst to best. Title on Sir Lord Alan Sugar's compy. The Amstrad version features full colour graphics (very pink though) and plays fairly closely to the Spectrum version, which will appear in this list in the not-too-distant future. It has a good rendition of the theme tune but suffers from a couple of major flaws: unresponsive controls and no side-scrolling graphics. The problem with the game not having side-scrolling graphics is that sometimes an enemy will enter the screen from the right just as you're about to exit it. The unresponsive controls mean that avoiding this enemy is impossible. In other instances, making a split-second change of mind is impossible. The game feels slugglish and is frustrating to play, and is in my opinion the worst version of the bunch. 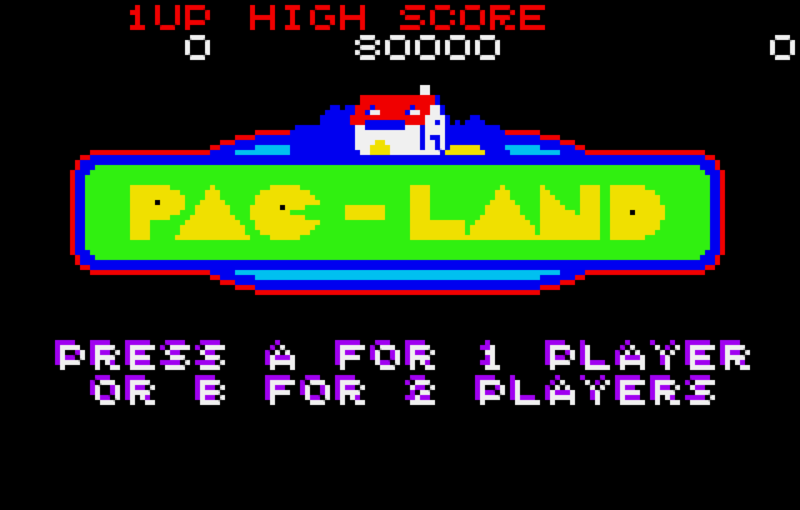 Amstrad: Pac-Land on the Amstrad is rather pink. The Phantom is pure genius and Tangerine Dream is Fab, apparently. This is a very close second-worst. 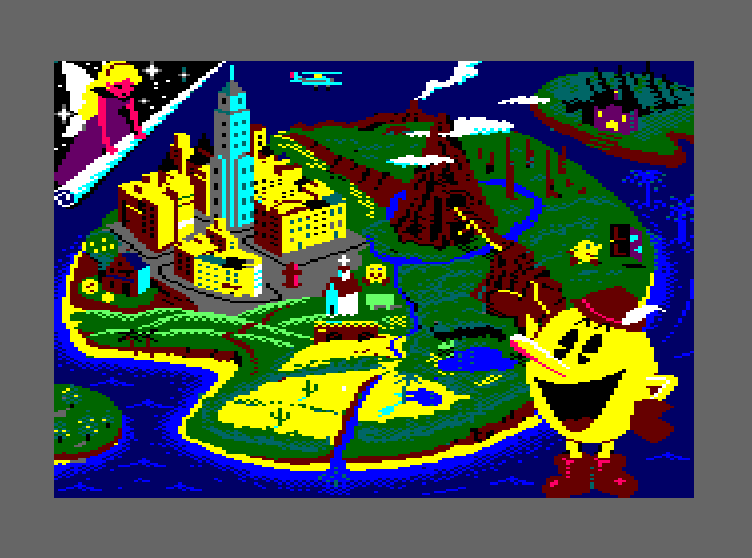 Graphically, it does away with the colours of the Amstrad version, replacing them with drab dark blues and yellows, which makes it look like Pac-Man is wandering about the streets of Pac-Land at night. 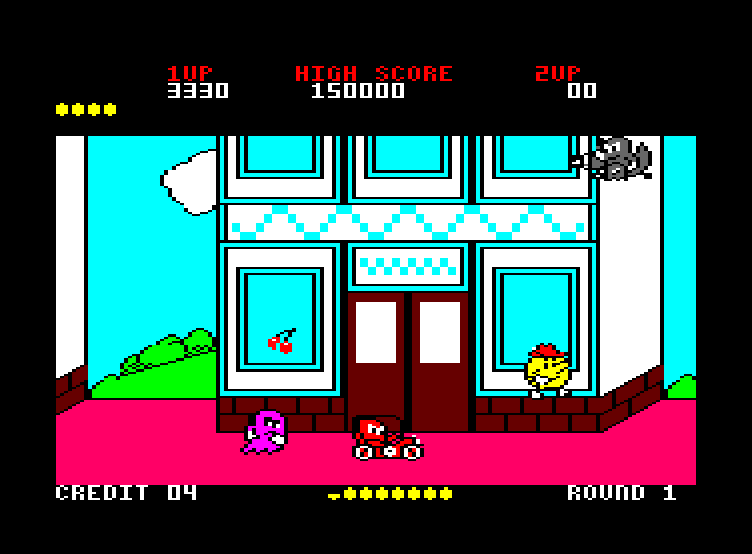 Its rendition of the arcade game's theme tune is identical to the Amstrad's version, and quite impressive it is too. Unfortunately, the game also replicates the Amstrad's flip screen technique, and therefore suffers from the same problems that not having side-scrolling levels causes. What prevents this from being the worst version though is that the controls feel ever-so-slightly smoother and a bit more responsive. Even so, Pac-Man will come to an unavoidable end much too often and it won't be long until you give up on helping him find magic shoes to hoard. Incidentally, both this and the Amstrad version feature a slightly modified version of the game's theme for the return journey, which is commendable. The rather beautiful title screen of the NES version. 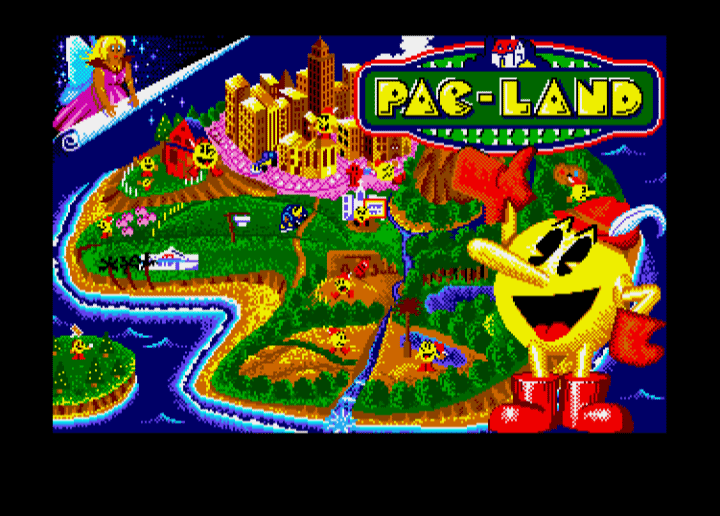 This version does away with the cartoony graphics from the original, and makes it look a bit like Pac-Man is travelling through a giant Lego version of Pac-Land. 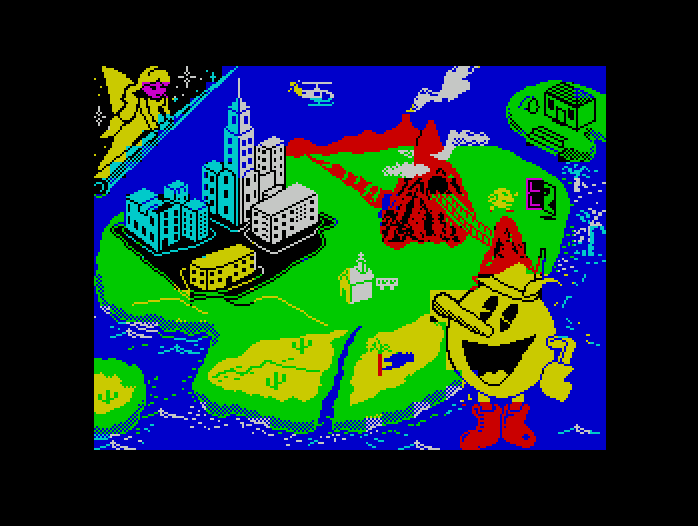 The sprites, both for Pac-Man and the enemies, are about half the size of those in the original, and are dwarfed in comparison to the backdrops. The music is OK, whereas the sound effects are quite close to the arcade's. What lets this game down though are the controls. 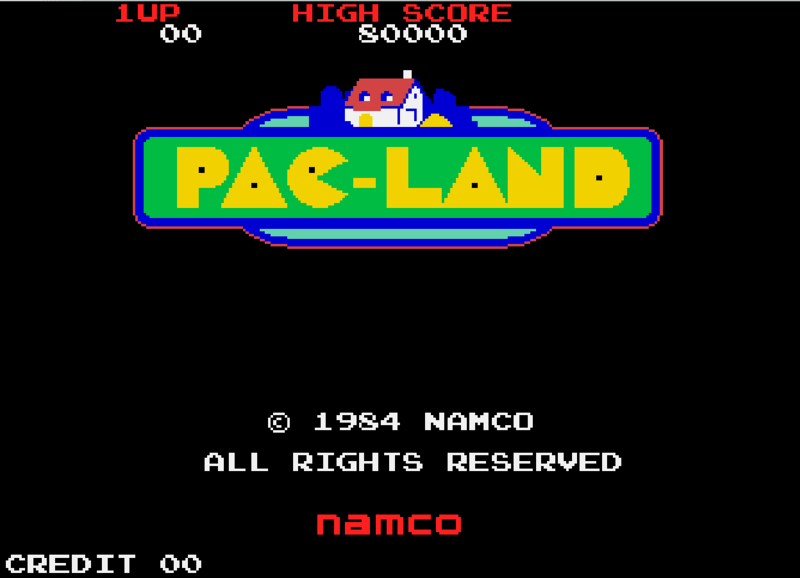 For some reason, Namco thought it would be good to use the NES controller's two A and B buttons to control Pac-Man left and right, and any direction on the D-pad to jump. Why??? Doesn't the very design of the control pad make it obvious which buttons should do what? The D in D-pad stands for directional, which gives you a clear idea of its purpose! You kind of get used to the stupid controls after sticking with them for a while, but when you come across an obstacle that requires some sort of split second decision, you'll suddently forget that you're meant to be using the controller back-to-front and press the wrong button. There's probably some way of reconfiguring the controls, but there shouldn't really be any need to do so for a game which by default should have clear controls. 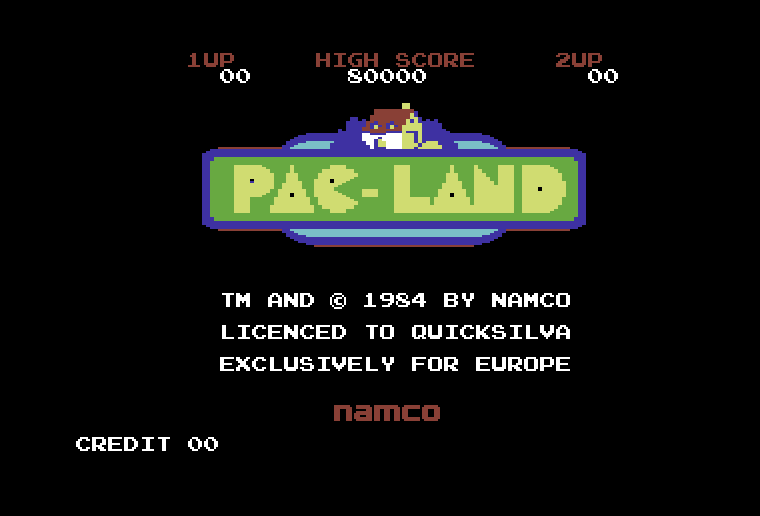 In addition, the levels appear to have been messed around with a little bit, and the game doesn't really feel much like you're playing Pac-Land. It's not awful, but it could have been much better. NES: I don't know why, but everytime I look at the graphics for the NES version, I feel thirsty. These title screens get sexier and sexier, don't they? Graphically, this is one of the best looking versions of the game, with sprites and backdrops that closely resemble those of the arcade game. The music is also pretty good too, and the fact that the game doesn't require a fire button means that you can use the controller's trigger button to jump, rather than having to push up (having to push up to jump in Amiga games was always a pet hate of mine). 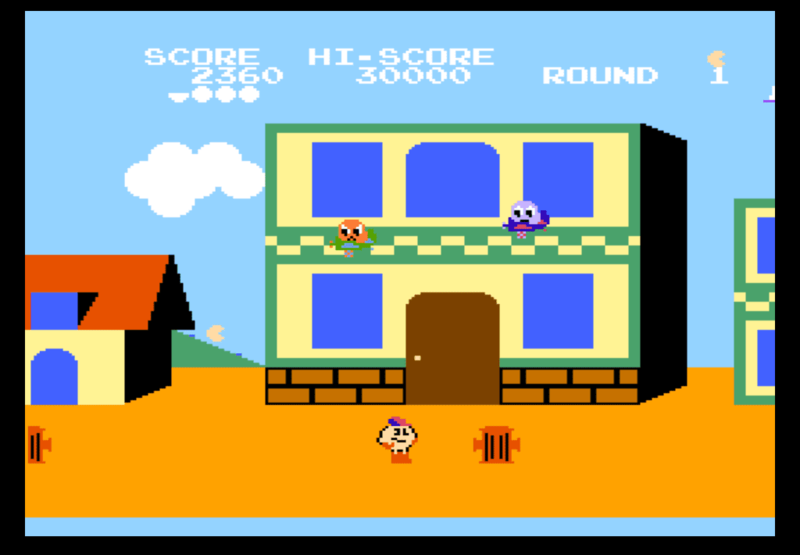 The level layouts are also fairly faithful to the arcade version's layouts, and unlike a lot of the other versions (Amstrad, Speccy, NES and C64), you are able to stand on top of vehicles, a feature of the arcade game. However, letting this game down is its scrolling. For some reason, Pac-Man's journey to retrieve magic shoes from the fairy at the other end of Pac-Land is literally not a smooth one. The scrolling is terribly jerky, and seems to get worse when there's more going on. At some points, it feels like you're playing the game in slow motion. This disrupts the arcadey flow of the game, and almost ruins what could have been a perfect conversion. Commodore Amiga: Looks nice, but if you could see this moving, you'll be tearing the disk out of its drive and flushing it down your toilet in minutes. Of the 8-Bit home computer versions, this is by far the best. 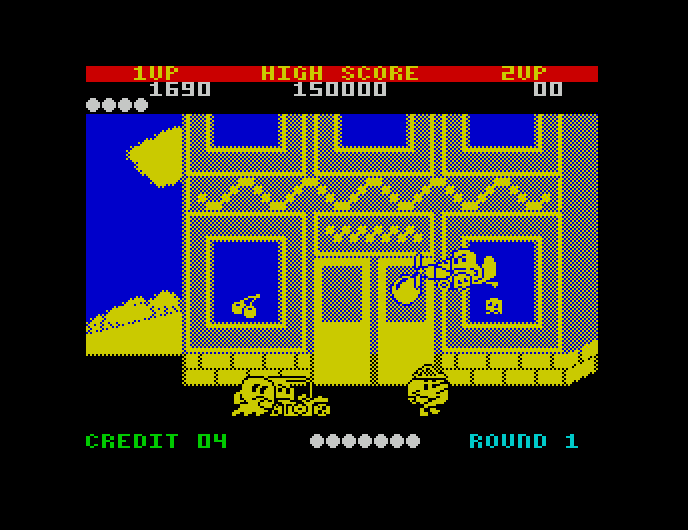 Although the graphics aren't as colourful as the Amstrad's, which is partly down to the Commodore 64's washed-out pallette, they are drawn much closer to the arcade's, and the screens scroll. And, unlike the Amiga version, they scroll smoothly, and this is what puts it just ahead of the Amiga version.Which begs the question, if it could be done on the C64, why couldn't the Amiga do it? The game does still suffer from some frustrating deaths, and you aren't able to stand on top of vehicles, which takes something away from the fun of the arcade game, and the level design is slightly different from the original. Even so, this is a very good conversion of the arcade game and is miles ahead of the versions on the computer's contemporaries. Commodore 64: I love how these old Commodore 64 games have always looked old. Woah! The Commodore 64 graphics may be washed out, but this certainly isn't! This is a very faithful conversion of the arcade game, probably the most faithful of the bunch, incorporating virtually all of the original's features, even the parallax scrolling, It plays well on the small screen, but is perhaps a little too tough and doesn't feel as whizzy as its arcade parent. Atari Lynx: Pac-Man on the small screen. Quite simply the most beautiful title screen in existence. Ever. PC Engine: Pac-Man has a power pill just above his head, and is ready to gobble up the ghosties. Unfortunately, he ended up getting squashed by the two cars as I was fannying about trying to get a screenshot. 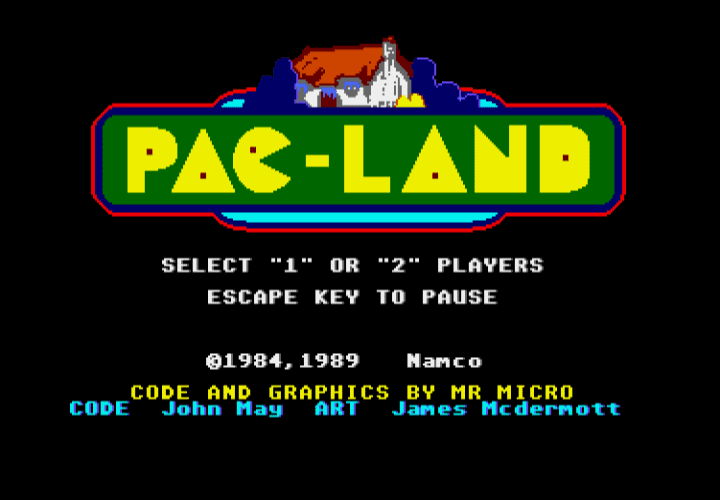 As an extra treat, while waiting for the home computer versions to load, you were treated to a rather funky map of Pac-Land. And, here they are. Exciting! The Commodore 64 loading screen in a wonderful watercolour style. The Commodore Amiga loading screen - plush and full of colour and life. I'd like to move there right now.